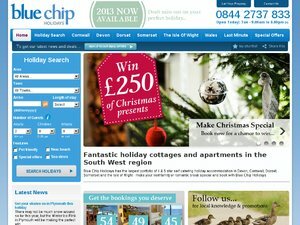 Self catering holiday cottages and holiday apartments by Blue Chip Vacations UK. Holiday cottages available in Cornwall, Devon, Newquay, Looe, Paignton, Torquay, Brixham, Dartmouth, Exmouth and Bigbury. Offer condition: No nights: 3 - 6. Arrivals: 27th September 13 - 19th October 13. Do not miss another Blue Chip Holidays voucher! Simply leave your e-mail address and we'll always keep you informed of new vouchers for Blue Chip Holidays. Offer condition: No nights: 7 - 21. Arrivals: 27th September 13 - 19th October 13. Offer condition: This discount only applies to new bookings. Bookings with an arrival date between 10.04.2012 and 21.05.2012 Discount applies on a minimum 3 night stay. Selected properties only. 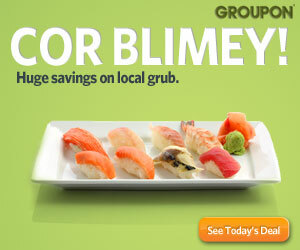 This offer cannot be used in conjunction with any other discount This offer may be withdrawn at any time. Offer condition: The discount only applies to new bookings. Bookings with an arrival date between 31.03.2012 and 30.04.2012 Discount applies on a minimum 3 night stay. Selected properties only. This offer cannot be used in conjunction with any other discount.This offer may be withdrawn at any time. Offer condition: Valid on stays arriving 01.10 until stays arriving 26.11 Applicable only to selected properties (those who were in the last discount). Offer condition: Holidays must start between Friday 6th May and June 25th. Offer condition: All 7 night stays departing in May or October 2010 will receive a years free subscription to 'Coast' magazine. Only valid new bookings, cannot be used in conjunction with any other offer or discount. Only one subscription per household. Offer condition: Stays must be 7 nights or more. Holidays must depart by 17.07.10.This promotion cannot be used in conjunction with any other discount. Offer condition: Save 20% on stays of 3 nights or more at selected ROCKLANDS apartments in Newquay taken between 09.12.09 and 27.03.10 Cannot be used in conjunction with any other offer or discount and is only valid for new bookings. Offer condition: Minimum stay of 3 nights and must include either Christmas day or New Years Day. Must use code to claim the discount. Cannot be used with any other offer. Offer condition: Pets go free at apartments 1,2,3 & 6 Horizons in Newquay for the rest of 2009. Cannot be used in conjunciton with any other offer or discount. Offer condition: Book a stay in Newquay and receive a £50 voucher to spend at Fifteen" restaurant at Watergate Bay. Stays must depart by 19.12.09 - new bookings only. Latest voucher code valid at a time of promo publication was entered to be working from 2013-08-29. English Country Cottages, cottage holiday rental for holidays in England, Scotland and Wales.